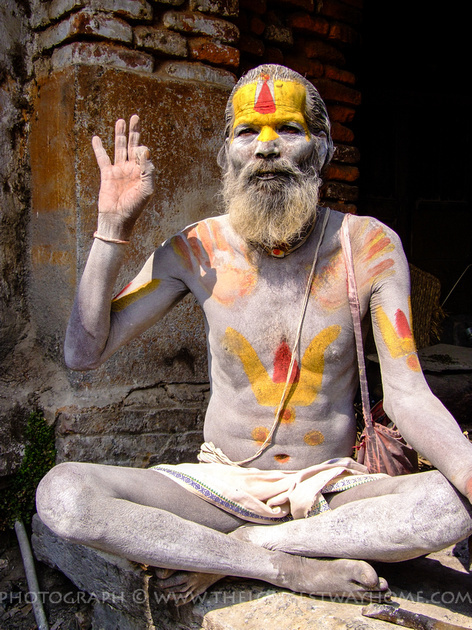 Sadhus in Hinduism are wandering holy men or monks revered for being good. Many Sadhus are also Yogis who are practitioners of meditation. They have have chosen a life away from or at least on the edges of normal society to focus on their own spiritual practice. 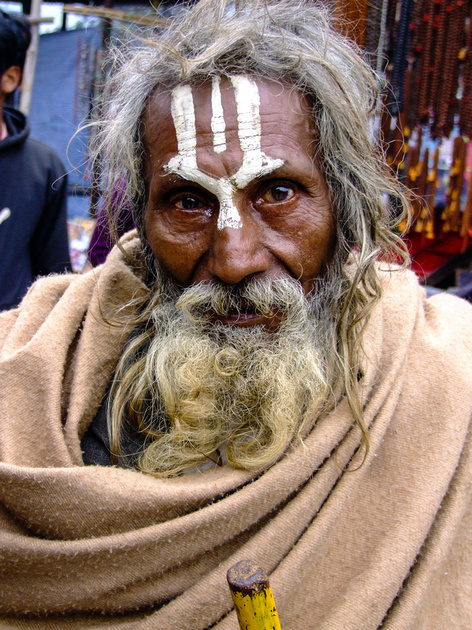 Talking with a Sadhu is said to either be wildly confusing or deeply insightful. Either way being able to speak Hindi is a huge advantage in deciphering what they are saying. However a few Sadhus do understand more English than you might at first have guessed. Please note that these photographs are copyright protected. If you would like to buy a print then do visit my travel photography gallery of Nepal. If the image is not available there, or you would like to use the image for a personal or commercial website then contact me directly. They do not have any material nor sexual attachments. Many live in basic dwellings such as in caves, forests or Hindu temples. Some Sadhus claim to live with ghosts in cemeteries. Sadhus live on the support of the people they encounter. Though the purists say otherwise in my experience they do accept donations for food or clothing. Such a life of hardship means not many follow the path of a true Sadhu. However there are many fake Sadhus who come out only on such occasions as festivals to cash in on the generosity of others. Or simply to make money by other means. 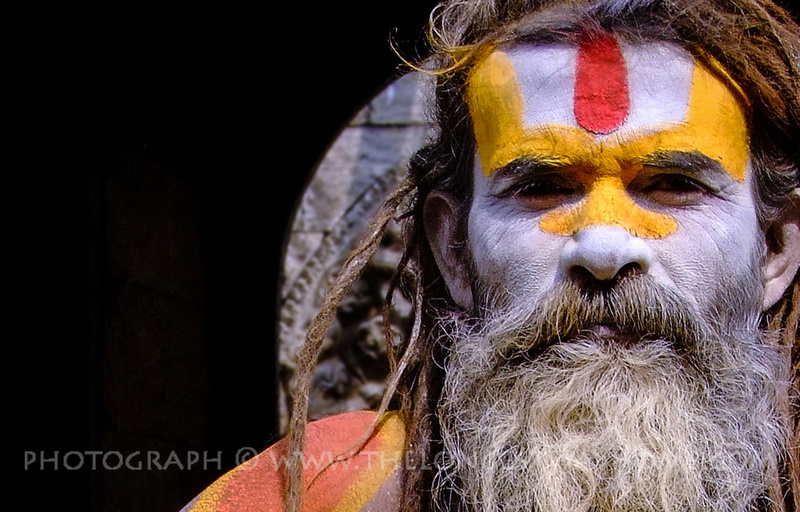 At Pashupatinath one man claiming to be a Sadhu approached me looking for money. A Nepalese friend said he was from India. I told him to go away and that I came here to see Nepal and not hand money to people asking for it from India. The crowd around us broke out into a loud cheer of Nepalese national pride. The money asking Sadhu slipped away. After an education a Sadhu will first cut ties with everything. Including possessions, friends, family and society. They are in fact declared ritually dead, and often attend their own funerals. They must then seek a guru to perform ‘guruseva’ which means service and learn the ways of the Sadhu. 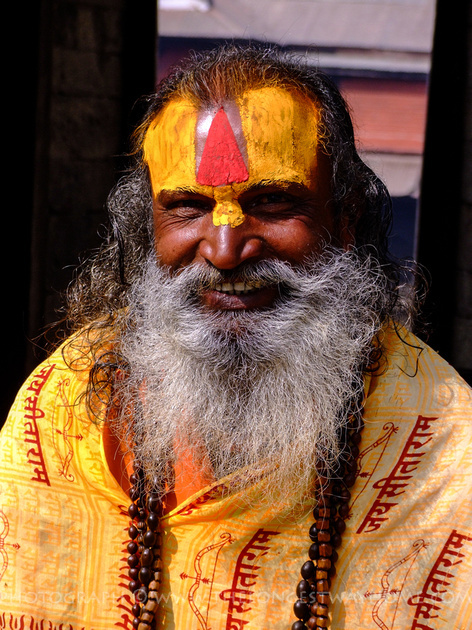 Throughout India and Nepal there are many different sects of Sadhus. Each sect has their own rituals and rights of passage before allowing an individual to become a Sadhu. Women can also become Sadhus and are known as Sadhvi. 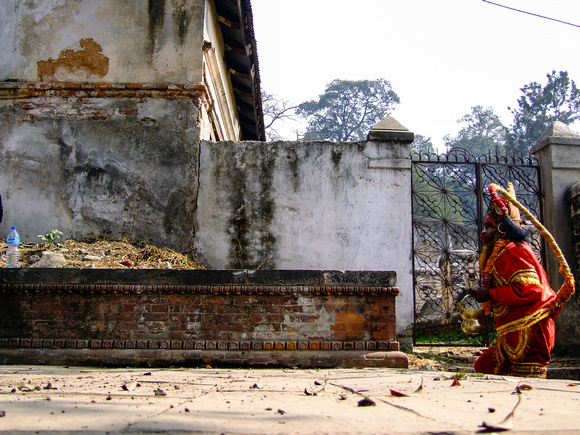 Sadhus often take on pilgrimages to various religious festivals in both India and Nepal. The most celebrated festival of Sadhus in Nepal is Shivaratri. Shivaratri is held in honor of the Hindu deity Shiva. 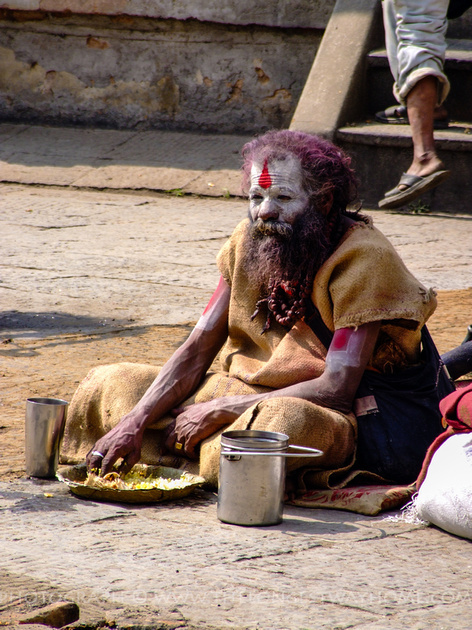 If you visit Nepal during this time you’ll see many Sadhus in Pashupatinath which contains Nepal’s oldest Hindu temple. Sadhus in Nepal are well-known for smoking hashish. They use the drug to help gain a high level of meditation. It is not uncommon to find a naked “Naga” Sadhu at festivals or meditating. 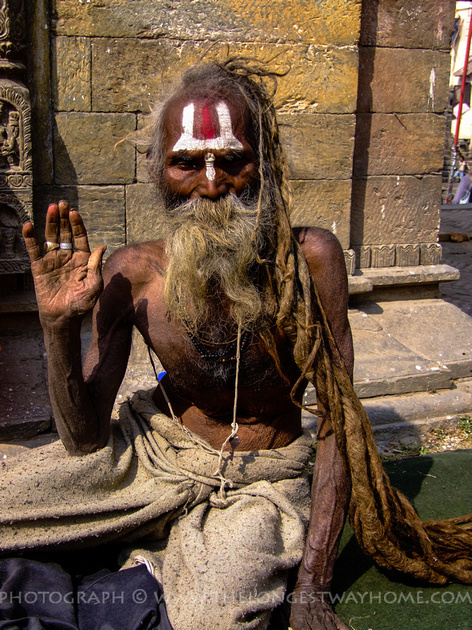 Some Sadhus belong to sects that do not shave and let their hair grow into dreadlocks. While at Shivaratri in Nepal I came across one the more unusual Sadhus. 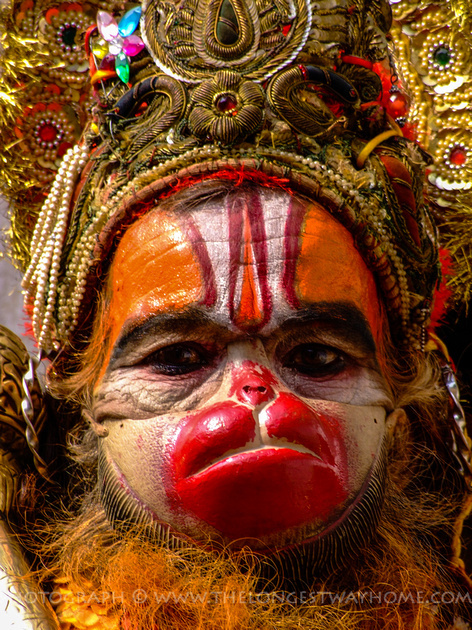 A Sadhu dressed like the Hindu deity Hanuman who has the face of a monkey. I’m told that this is how he makes his living as he does create quite an attraction. I did witness the Hanuman Sadhu eating and talking with other Sadhus so I don’t think it’s all gimmick. The costume itself is elaborately decorated and complete with a monkey’s tail. The man behind the mask bares lines of age so I do also think he’s been around a while. I can’t promise all of these Sadhus are Nepalese. But I can promise they were all in Nepal when I photographed them. 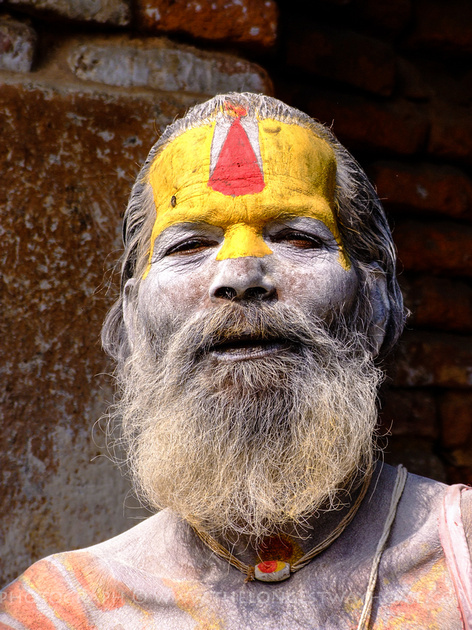 Sadhus are wandering Holy men that traverse not just Nepal and India but further afield as well. They are a different breed of traveler. They live like few other people on earth. 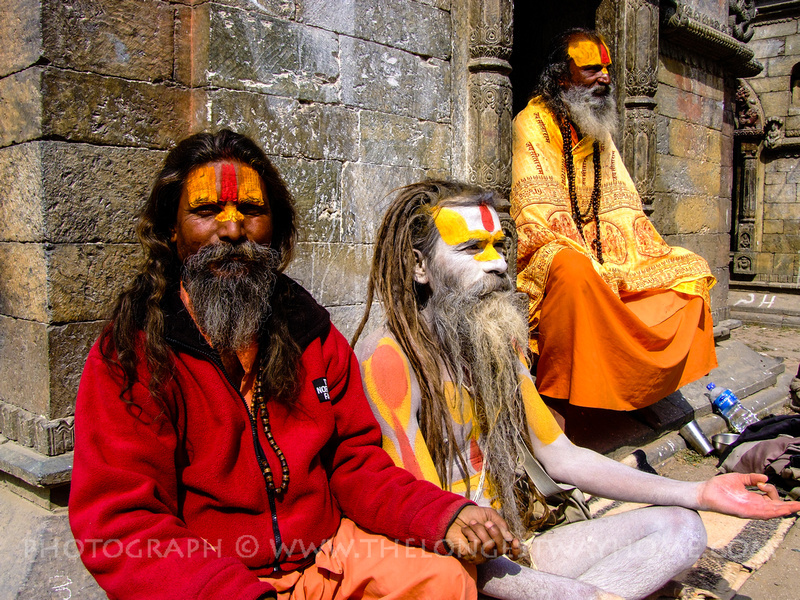 These are the Sadhus of Nepal. Hey Dave, this is great. I really enjoyed seeing so many photos of the Sadhus – I don’t have a lot to say, I just wanted to let you know this was a great start to my monday morning. Cheers. I could easily imagine that Michael! I wonder how much these guys have changed with the times since then. To experience such sights. These Sadhus look amazing. Did you talk to any of them? Very interesting to learn about other cultures. Great photos! What do they do in winter? Are they also able to walk around in little clothing, like the Tibetan monks do? Some of these photos were taken at the tail end of winter. The sun was shining but in the shadows it was cold. I’ve seen them wearing heavy blankets, but still bare foot. I assure all these guys are from Nepal. I took photos,of them two years ago, and then last week. Holy? I dunno. Colorful tourist attractions, for sure. Holy was a few months ago :) They tend to come out at many religious festivals. Shivratri in particular. Great article, great photos. I wonder how did you manage to take their pictures? anyway..interesting to know that they will first cut ties with Everything, including friends and family. hmm..but they are still friends with each other, right? Thanks. I went up to them and took their photo! I did bring a Nepalese friend to help with trying to talk with a few. But even then it wasn’t that easy. Not everyone believes in their ways. They come from all over the country, and don’t all live together. So at festivals and things they recognize each other I’m sure. The three together in the photo above travel together as well. I remember them from 2008. Today they help the really old Sadhu I photographed above to move around. Really fascinating, thank you for sharing! Some great shots there Dave. Ditto with Michael. Number one is a classic. Great composure and sharp…. The old Baba’s of India and Nepal bring back quite a few old memories. I met some absolute crackers in India. No matter how hard I try. I find it difficult to even comprehend their life’s journey. Thanks Jason. I have a hard time comprehending anything they say! I think their way of life is changing with the times. Nepal is on of the last bastions for old school ways of the world. Wow, great pics…I love that monkey costume! Wow, exceptional photos! And interesting article about Sadhi’s. I dunno how you get your info but I wish I could get some of the insider info you do when I travel. Brought a local or two to translate. Helps to be here a while. Talked with many people about Sadhus and traditional people in Nepal. Guess is all kind of comes together! Loving the colors. Stunning photographs, as always. It is a treat to catch up on your blog on a sunny and frigid Friday afternoon in New England, knowing that I can get lost in pictures and stories, instead of being called to do my grad school reading. Hope you are well, friend.